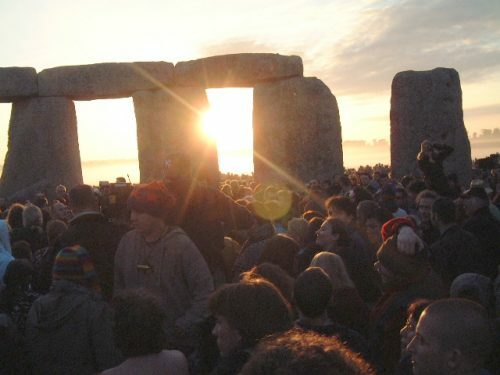 Thousands of people in UK have gathered at Stonehenge for the sunrise on the summer solstice – the longest day of the year. Spectators were joined by pagans and druids at the ancient monument in Wiltshire, but the dense cloud cover meant the sun remained hidden. Police, who estimated 21,000 people attended, targeted the crowds with sniffer dogs and took 22 people into custody for drugs-related offences. The solstice has had spiritual significance for thousands of years. The word itself means a stopping or standing still of the sun. A crowd had gathered to spend the night near the giant stones, with police reporting 2,000 people on site by 21:30 BST on Thursday. The sun then rose at 04:52 on the longest day of the year. Supt Matt Pullen, from Wiltshire Police, said: “The majority of people respected the conditions of entry and the amnesty bins provided were used. Twenty-two miles away at Avebury, where there are three smaller stone circles, the crowd peaked at some 500 people.